A drain that is not working correctly is no fun, and you do not want to deal with a drain like that without an expert on your side. If you have a drain that is not clearing out fully and that is not taking water away like it is supposed to, you need to find someone who will help you out. You need to find someone who knows how to clear the drain. We are here for you and we will take care of things for you in a knowledgeable way. We will work for you as your clogged drain specialist in Queen Creek, AZ. It is important that every drain in your home works as it should. As soon as you notice that one of the drains in your house is failing you, you should find someone who will come to your home and get it working again for you. You need to find someone who will have time for your drain right away and who will be able to clear it out right away. It is important for the issue to be handled as soon as possible so that you do not deal with any more trouble than you have to. 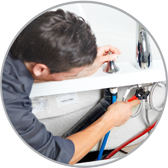 When you are looking for a clogged drain specialist, you can trust us and the help that we give. When you are trying to find someone who you can pay to work as your clogged drain specialist and you are not sure who out there you should turn to, know that we will treat you right. We will clear your drain for you without overcharging you for the job that we complete. When you let us handle the clogged drain needs that you have, you will get the help of a clogged drain specialist in Queen Creek, AZ at a price that fits your budget.